Though all the songs of Sultan will not burn the charts, there are numbers that will keep both Salman fans as well as the purists happy, writes Aelina Kapoor. It has been a while since Vishal-Shekhar came up with a full-fledged soundtrack. Way back in 2014, they delivered Happy New Year, Bang Bang!, Gori Tere Pyaar Mein! and Hasee Toh Phasee. The albums met with mixed reactions. When Vishal-Shekhar weren't heard all through 2015, it was assumed they had taken a pause to reinvent themselves. Now, they are back with Sultan where they come together with lyricist Irshad Kamil and deliver as many as nine songs that offer good variety. The album kickstarts with a cracker of a song, Baby ko bass pasand hai. It manages to establish an instant connect as the Haryanvi sound fills the proceedings. Following a good start by Isheeta, Dadlani comes behind the mike and his loud pitch pretty much sets the stage for what follows. Shalmali Kholgade lends her voice to Anushka Sharma for the song and, once Badshah brings on his desi rap, the cycle is complete and the song emerges as a winner. What makes it all the more addictive is another version that is sung by Salman Khan and Iulia Vantur. The song that follows has a soulful appeal and Rahat Fateh Ali Khan does justice to Jag ghoomeya. One has to acknowledge Kamil’s beautiful lyrics. There is an earthy feel to this sweet love song that makes you revisit it repeatedly; there’s a slower avatar rendered by Neha Bhasin as well. Would Arijit Singh's version (this is the same controversial number that made it to the headlines some days ago) have been better? One will never know, but this one sounds just fine. One wonders, though, what a song with the title 440 volt is doing in this album. Typically, in films like Sultan, one massy song is good enough. Since Baby ko bass pasand hai has already played that part (and rather well at that), this tapori track with Mika Singh as the vocalist is puzzling to say the least. Is it bad to hear? No. Is it memorable? No. Thankfully, the album comes back to what it truly should be, with Sukhwinder Singh and Shadab Faridi bringing on the title song. With its inspirational lyrics, something that is expected in this genre, Sultan has a thunderous appeal. However, as generally happens in the current musical scene, what stays with you is the opening line and the hook of Sultan. Ditto for the slightly different version, Rise of Sultan, which has Shekhar Ravjiani behind the mike. There continue to be ups and downs in the album, as Mohit Chauhan and Harshdeep Kaur take Sultan into a different zone with Sachi muchi. It is apparent that Vishal-Shekhar wanted a different kind of pitch in the soundtrack for most of the songs. The results are mixed, as not every song turns out to be a perfect fit into the album. Sachi muchi js an easy hear, but that's about it. Papon, who is rarely heard in Bollywood, justifies his presence with Bulleya. A Sufi track that has a soulful appeal (just like Jag ghoomeya), it fits in well as a situational number. Though it isn't the kind of song that sticks in your head even after repeated hearings, it does make for a nice inclusion in the overall scheme of affairs due to the quietness it brings. The album concludes on a high with Nooran Sisters and Vishal Dadlani coming together for Tuk tuk. Like the opening track, Baby ko bass pasand hai, this too has a Haryanvi setting. That said, while the former was a fun track between the two lovers, the latter is more about inspiring Sultan to achieve what he desires. 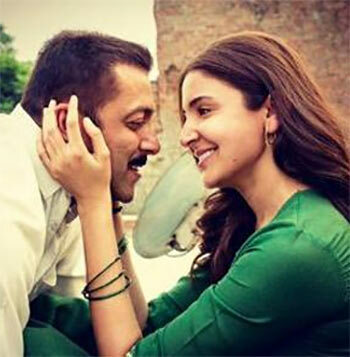 Sultan is a largely satisfactory album with good variety on offer. Though all its songs will not burn the charts, there are numbers that will keep both Salman fans as well as the purists happy.